The Book of Standage: Halloween! Halloween has been great this year. 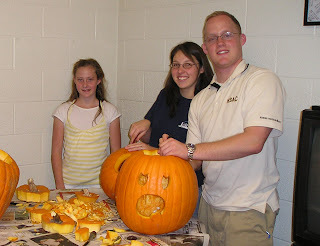 We are on the activities committee at church, so we helped put together the Halloween social this last Saturday. We had a great turnout, original costumes, and tasty food. It turned out great! We also had Mom and Dad Standage join us for family night on Monday. They brought their pumpkins, and we had fun carving together. Take a look at the photos!